A wonderful Umbrian tower has been completely transformed with an intriguing blend of English and Italian country style, a mix inspired by its ower's love of tradition and refinement of taste. There's a stillness about this beautiful house in the vicinity of Todi. The calm is beguiling and nothing is hurried as its owner moves about the place, arranging flowers fresh from the garden. Watching her work in the traditional interior, she has created a gracefull living. Catherine purchased this house last year and her Umbrian property is now a perfect synthesis of Italian and English country style. Her initial plan was to rent for a year to see whether she could live in such an out-of-the-way location. From the start, the village life was very important to her and she got involved with all the village committees. 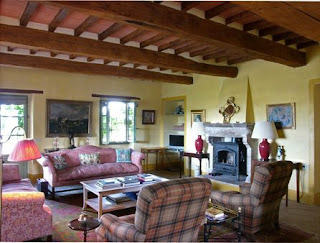 It was actually one of the villagers who suggested that Catherine should look at this Italian villa, which was for sale. Catherine renovated the property from top to bottom. She repainted the walls with pastel colour tints- she has a distinctive way of choosing colours for the interior: "Often the best way to find a shade for each room is to consider what would suit a particular painting"; polished and stained the terracotta floors and everything instantly turned the character of the house completely. She bought beautiful lamps combining ceramic and granite, hand made curtains made out of precious fabrics, carpets, towels and cushions. She also bought some local art pieces. Not surprisingly the attention to every detail and all aspects of her work throughout the house, have meant that the property is now wonderful and most importantly is just Catherine's house in Italy. It's very unique and done with taste!